The Florida Grand Opera is only one of a handful of companies to perform "Mourning Becomes Electra." 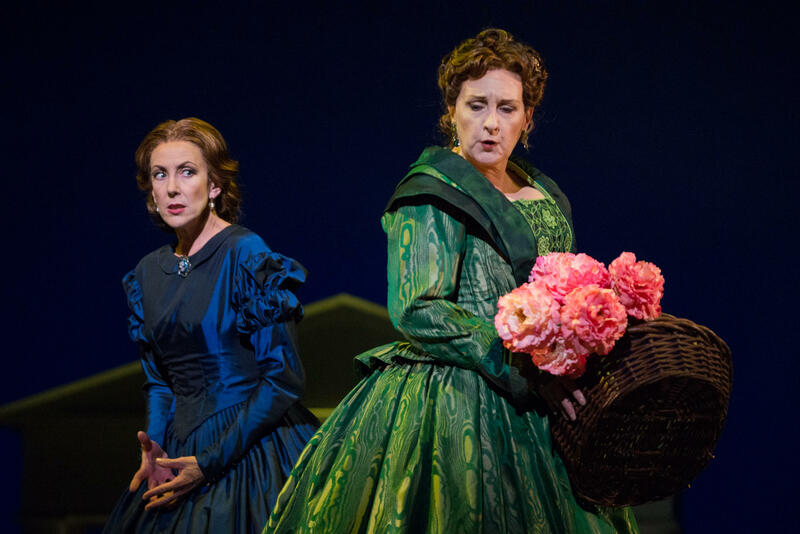 Sung in English, "Mourning Becomes Electra" is a retelling of the Greek tragedy, Aeschylus’s "Oresteia" trilogy, set in New England during the Civil War. A wife falls in love with another man and poisons her husband — but before he dies, he’s able to tell his daughter what happened. "It’s all about family relationships, kids and their parents," said the production's director, Kevin Newbury. "It’s very Freudian." "Mourning Becomes Electra" has had trouble gaining traction. It was first performed by the Metropolitan Opera in 1967, and it virtually disappeared for three decades before the Lyric Opera of Chicago successfully revived the work in 1998. Now, "Morning Becomes Electra" can tick off a fifth company as the Florida Grand Opera opens its 73rd season with a new production. Newbury says FGO's version is more surreal through its use of sets, video screens and light projections that "emphasize the ghost theme underlying this piece." Performances are November 7 and 9 at the Broward Center and November 16, 17, 19 and 23 at the Arsht Center. Cultural happenings are cropping up in full force this season in Broward County. The forthcoming arts calendar is brimming with so much to do and see you'd wish you were in two places at one time. We've compiled this series of events-- small and large, prestigious and homegrown--so you can plan ahead and not miss out on what intrigues you. From thought-provoking lectures with renowned artists to massive puppets on parade in downtown Fort Lauderdale, an array of cultural offerings exist in Broward County.